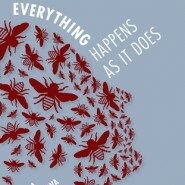 Albena Stambolova’s idiosyncratic debut novel, Everything Happens as It Does, builds from the idea that, as the title suggests, everything happens exactly the way it must. In this case, the seven characters of the novel—from Boris, a young boy who is only at peace when he’s around bees, to Philip and Maria and their twins—each play a specific role in the lives of the others, binding them all together into a strange, yet logical, knot. As characters are picked up, explored, and then swept aside, the novel’s beguiling structure becomes apparent, forcing the reader to pay attention to the patterns created by this accumulation of events and relationships. This is not a novel of reaching moral high ground; this is not a book about resolving relationships; this is a story whose mysteries are mysteries for a reason. Written with a precise, succinct tone that calls to mind Camus’s The Stranger, Everything Happens as It Does is a captivating and detail-driven novel that explores how depth will never be as immediately accessible as superficiality, and how everything will run its course in the precise manner it was always meant to.